I got my sister a gift certificate at Restoration Hardware for Christmas. They sent along a catalog that weighed about as much as my 3 year old nephew so I chose not to carry it on the plane with me lest I be charged an overweight bag fee. I was thumbing idly through the catalog this weekend and I was struck by its design. You can view the catalog online to see what I am talking about. Some of it resembles a magazine with stories about the artisans who apparently produce some of the goods they sell. Each page has notes with arrows with tidbits about each of the items like the fact that a $2500 dining room table is a “reproduction of a perfectly proportioned stone column in ancient Greece, built of solid reclaimed pine timbers from 100 year old buildings in Great Britain.” Obviously, they are selling to people who value and find satisfaction in their home furnishings having certain features and provenance. One of my immediate thoughts was that arts audiences often want the type of experience illustrated in this catalog when they come to the theatre. Except that we would have to charge the type of prices Restoration Hardware does just to produce a season brochure that communicated in the fashion of the catalog, not to mention the cost of actually providing the experience. Of course, the whole image being conveyed would prove intimidating to large swaths of the population to whom we are trying to appear my accessible. As we are very much aware, there aren’t a lot of people willing to pay the type of price necessary to have that experience. After awhile, I thought about the fact that a lot of retail stores are designed to appeal to the idea people have about themselves rather than to who they really are. For example, I read an article that pointed out that while some national clothing stores seem to be designed for 17 year olds and have pictures of people that age, the stores tend to be filled with 14 year olds because its fits the 14 year old’s desire to appear more mature. Whether that was the initial intent of the store or not, they knew who comprises their customer base and are sure to provide the appropriate range of sizes and styles. 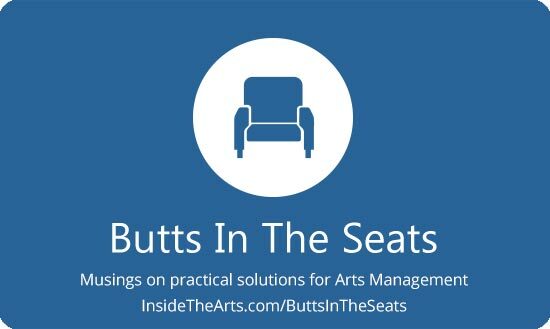 So I have been thinking about how arts organizations, (and mine in particular), can identify what image audiences have of themselves when they attend performances and adjust the physical, social and customer service experience in that direction without incurring large expenses. There was some research a while back which found a possibly-surprising result. …if you serve the same wine to a lot of people, and tell some of them it’s $12 for a box and others it’s $400 for a bottle, the latter like it better. Better yet, they’re right — they really do enjoy it more. Thank you, MRI scans and the like. …So say you have a steak roughly of the same quality as the $13 steaks at the Outback Steakhouse. The menu says $26, your bill when it arrives has a 50% discount. But everything you order feels expensive. Can it really be as easy as having a perpetual 50% off sale? We are all aware on some level that when a store has a sale with deep discounts, the original price they are quoting was probably inflated. We may grouse and think it is a little dishonest, we are still out there buying from that store on a regular basis. And this feeling of being in a dishonest situation can be ameliorated by providing sincerely good service (leavened, perhaps with a little bit of the personality that appeals to the specific customer). The other thing is, no one actually ever pays full price, even accidentally, and everyone knows it. That isn’t something you can know for certain when it comes to airplane tickets, a pricing model it is often suggested performing arts organizations adopt. So the big question is, do you take advantage of customer psychology to provide audiences with a satisfying experience? Oh, actually, you already do in a thousand different ways with your marketing, pricing and other practices. Question is, do you do something so blatant? Given that in some cases the placebo effect works even in the face of full disclosure, it is tempting to try out such simple way to create an experience. Many ticketing systems, including my own, make it very easy to print one price on the ticket and set the actual price much lower. Long ago, David Merrick opposed the TKTS booth idea because he predicted that it would create upward pressure on list prices. It turns out that he was correct. Maybe you should ask a different question, “Do I want to make my tickets more appealing to grasping first-generation professionals who cannot distinguish desire from price or exclusivity?” In New York City, pricing printing on a ticket is highly regulated. I’m also concerned about honesty and transparency in not-for-profit management. What does an annual income budget look like when it is made up of false data? The airlines can get away with adjacent-seat-price-envy because people have to get somewhere. They don’t have to buy a theater ticket. And I resent recent growth in Yield Management in theater ticket pricing. I am not sure this sort of pricing will contribute to any more dishonesty in income reporting than would be available without it. I suppose you could claim you sold $50,000 worth of tickets, but if your income was only $25,000, that is all you can report. If I am going to lie, I don’t need to print it on my tickets. People are going to look at my bank statement for validation long before they will sit down and add up my stubs. If the TKTS booth has put upward pressure on ticket prices, then that is almost an argument to use the pricing. It proves some people will pay twice the price rather than stand in line in Times Square for what should be the more reasonable price. I know a guy who works at a Coach store who tells me the exact same story. The same purse sold in his store for $700 can be found at the outlet store 10 miles away for $400. The real price of the purse is $400. People think they are getting a bargain at the outlet because it is his job to run his store in a manner that adds $300 worth of ambiance to that purse. The whole point of the placebo pricing article was to illustrate how perception causes people to add value to things that don’t necessarily possess it. I don’t have different prices for different areas of my theatre because the house is so small the experience doesn’t appreciably diminish by the back row. However, I have one renter that does grade the seating and has no problem filling those higher priced seats. So am I the fool for giving up all that extra income for valuing all my seats at the same price? Am I even irresponsible to my organization for doing so?